Darling Home with Beach House Flair! 596 ChinquapinSunrise Beach, MO 65079MLS#:3085969Price:$175,000Bedrooms: 2Full Bathrooms: 1Half Bathrooms: 0PRICE REDUCED! Darling home with beach house flair on gentle lot on Shawnee Bend. This home is ready to move into. It features open living, kitchen, and dining areas with lots of windows to enjoy the lake views. Kitchen updated in 2001 with lots of cabinets and breakfast bar. Master bedroom on main level, lower level has one bedroom and a bonus room, perfect for extra sleeping. Wonderful outdoor entertaining areas. Deck with roll out awning and martini deck at water’s edge. There’s even a two well dock. All this located at the popular 13 mile mark. Kitchens have always been the remodel of choice when it comes to updating your home, but according to the National Association of Home Builders, bathrooms are now the top remodeling project for increasing a home's value. 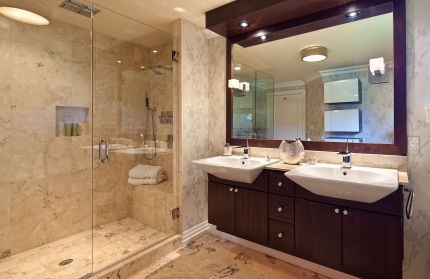 Bathroom remodels are much more modest than they have been in the past. Trends are showing that homeowners and buyers are looking for "easy upkeep, cost and accessibility." (according to National Association of Home Builders) . Spa-like tubs are being replaced by easier to maintain showers, LED fixtures are replacing traditional fixtures and water saving toilets and faucets are being installed. Family-Sized Home in Four Seasons! 1270 Palisades DriveFour Seasons, MO 65049MLS#:3086257Price:$375,000Bedrooms: 4Full Bathrooms: 2Half Bathrooms: 2Family-sized home in Four Seasons! Updated main level includes new flooring, tile, granite in kitchen, slate back splash, designer appliances, and gorgeous fireplace. The wall of windows lets in beautiful light and the Lake is right in your backyard. Large master bedroom with walk-in closet and wonderful, deep, jetted tub, plus access to the upper deck will be your private oasis. Open and light family room with fireplace and wet bar is perfect for family gatherings. Guest bedrooms are spacious with lots of storage. Maintenance free landscaping plus, dock and hoist in place, and ready for your boat, invite you to kick back and enjoy summer at the Lake!